This edition of No Recipes, features experimental Japanese food, a dessert revisited, and a No Recipes guest appearance on The Dairy Show. For those of you not familiar with these roundups, I use them as a place to show you my outtakes. Most of these dishes are either practice runs, left overs, or remakes of things that I’ve previously posted, which is why they don’t get their own post. Enjoy! Homemade Udon – Being the huge fan of homemade pasta that I am, it occurred to me that it was a little odd that I’ve never tried making any Japanese noodles at home. Of the Japanese noodles, udon seemed like the easiest to make, consisting of water, salt and flour, so I thought I’d give it a go. To get the characteristic chewy texture, it’s necessary to knead the crap out of it, so this is a job best left for your Kitchenaid + dough hook, or for one of those days when you feel like you need to take your aggressions out on something. After kneading and resting the dough, I rolled it through the thickest setting on the pasta maker, then hand cut it using a very sharp knife. The finished udon was boiled, chilled, then served with cold dashi and some tomatoes. Tomatoes may sound like a weird accompaniment, but they make for a nice umami bomb, and fresh counterpoint to the dense noodles. Pork Belly Stir Fry- This was one of those random dishes that came about because we didn’t really have anything else in the fridge. I found some sliced berkshire pork belly in the freezer, a half red bell pepper, a quarter onion, some serrano chilies, garlic, and wilting arugula. This all got sauteed with some fish sauce, soy sauce and brown sugar and was served with a sunny side up egg. 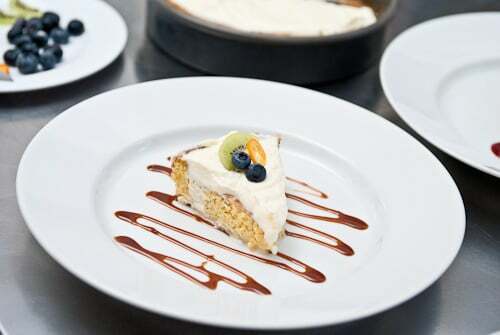 Pastel de Tres Leches– A couple months ago, I met Michael from The Dairy Show, who produces an awesome online show that covers all things dairy. He asked me if I wanted to do a show with him and I responded with an enthusiastic yes. This led to a Saturday shoot complete with tripods and lights in my tiny kitchen where we documented the making of my Pastel de Tres Leches recipe. It was a lot of fun, and I’m already thinking about other milk-centric dishes I can make with him next time. 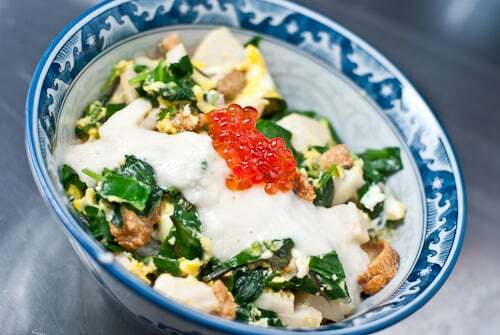 Sunchoke Mentai Hash – In Japan, it’s common to find shredded potatoes served in a sizzling skillet with cod roe and butter. 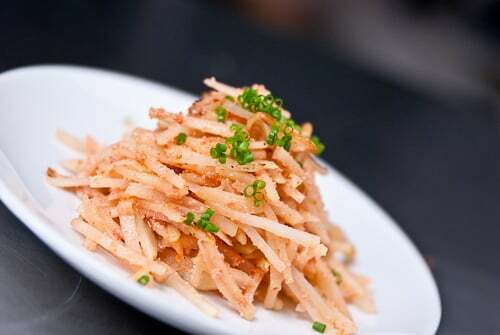 It’s an Izakaya (Japanese tapas bars) staple and more importantly, the combination of butter, crisp potatoes and cod roe is fantastic with a frosty beer. I decided to do my own take using sunchokes instead of potatoes. The sweetness from the sunchokes adds a whole new dimension to the dish, complimenting the creamy and briny components nicely. Scallop, Uni, and Ikura Donburi with Ramps- I had a small amount of sea scallops and uni remaining from some past meals and needed to do something with them before they went bad. Donburi’s are a great way to use up leftover meats and veggies. Just saute everything in a little oil, add some soy sauce, mirin, sugar and dashi, then pour some beaten eggs all over everything. Cook covered for a few minutes to set up the egg, then serve the omelet over a bowl of rice along with any remaining sauce in the pan. This one got topped with some grated mountain yam and ikura. I’m eating at your house from now on. Love the Umami Bomb–great description! Amazing presentation and the food look so delicious Marc! As always! Homemade Udon! You have GOT to tell us more about that, Marc. I am intrigued. What kind of flour do you use? How do you roll and cut it? Etc. 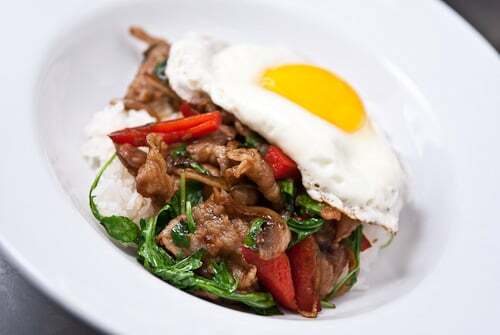 Everything looks so good, especially the pork belly stir-fry. You explained the Udon in the post. Duh. Sorry. 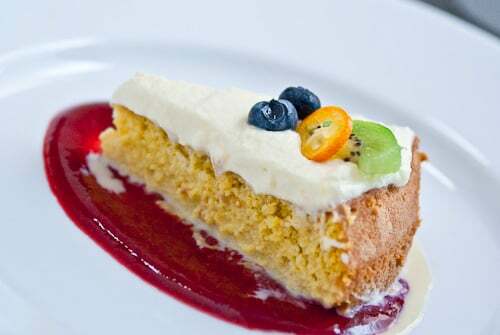 Your tres leches cake look fantastic! The fruit on top and the sauce are great! Homemade udon? We need homemade soba last fall but didn’t love the results. They have become our white whale. I don’t think I should start with the udon–how many whales can one need. BAM!!! I’m suddenly hungry…just like that after reading this post. Your ‘outtakes’ looks so delicious! I still haven’t gotten round to making my own udon yet. I must, I must.. I think I love your site so much because I see foods/flavors/combo’s of things I would never make. I love udon noodles, and I have a kitchenaid, so I may just have to try that! Everything looks great Marc! Have a great weekend! Homeade udon? So delicious..especially on a rainy day.